Want to know more about our trip? Our team will give a presentation on September 15th to talk about what we did, why we did it, and how it impacted the people of Ethiopia as well as ourselves. All are welcome. 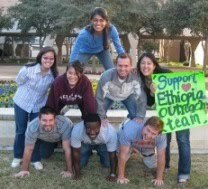 For MS1s interested in participating in Ethiopia Outreach in Summer 2011, applications will become available at that time. We will have an additional "interest" meeting for people to ask questions about the trip and the application process. For more information, please email uthscsaethiopia2010 (at) gmail (dot) com. Its a great pleasure reading your post. ts full of information I am looking for and I love to post a comment that "The content of your post is awesome" Great work. Thanks to "Ethiopia" to offer excellent time with us to meet and share our motto to each other. We are your health like that aging of eyes, skins and fitness with Golden Jojoba oil and other with brand and valuable subject like that www.aosproduct.com in which we develop numerous products. Thanks to share your interest with us.